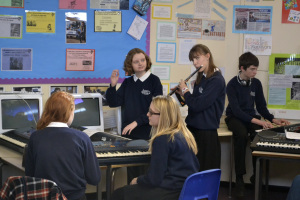 My second school visit this week was to Wymondham to visit Musical Futures Teacher Kitt. I was looking forward to seeing how he’s been getting on in his first Head of Music role. Kitt spent his second placement at Monks Walk and he has always been committed to embedding Musical Futures approaches, pedagogy and ethos into his teaching, giving it a personal twist to suit his own teaching style and musical values. In both schools I visited this week, I was impressed not just with the engagement of the classes we watched but also the consistency of expectations and musical competency the students showed. They all participated, performed, shared, played informally to each other, talked about the work and stayed on task. For the majority of the lesson they were engaged in musical activity whether this was warm ups, rehearsing in groups or listening to each other. There was no written work in either lesson, no painful Q and A about the elements of music, however there was clear musical progress made and no question at all that they were learning-I could feel it, see it, hear it. It was in the conversations between the students during group work, the nodding of heads in time to the pulse, recognisable musical outcomes, ensembles coming together. This week I saw Musical Futures teachers with a very clear understanding of what they were teaching, how they wanted to facilitate learning and why this made sense in the context of their personal musical values, their departments and tailored to suit the demographic of their students. 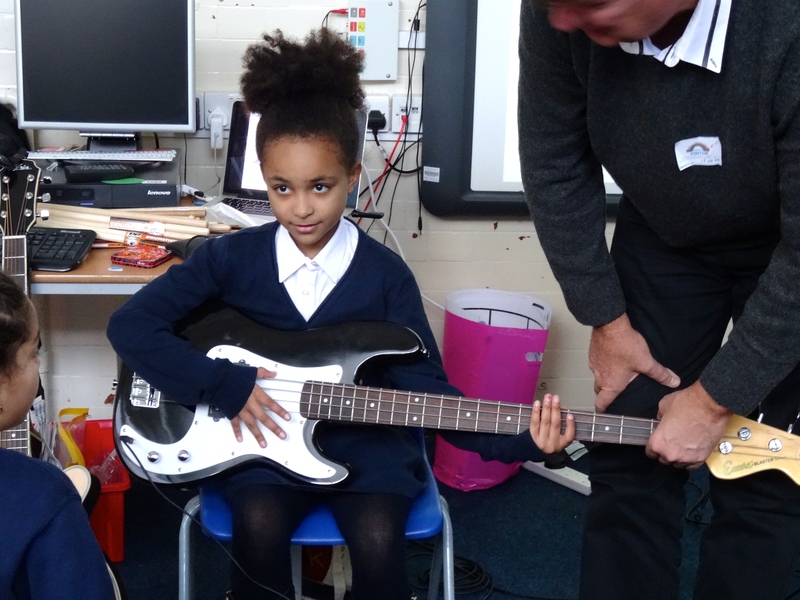 But I also saw how embedded Musical Futures is into every year group, it’s definitely not a “MF-style 6 week rock and pop project” in these schools! In just 5 weeks at Wymondham, Kitt has gone into his new role with a clear vision. Desks have gone, new equipment prioritised, ordered and set up, other staff supported to bring in MF approaches with all year groups. But I was most impressed by what happened at the end of the day. MF Australia director Ken and I delivered a practical session after school to 6 local primary school music co-ordinators, a music hub representative, a woodwind teacher from the school who stayed unpaid because she was interested and 2 6th form girls who thought they might like to be primary school teachers. 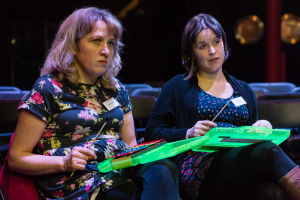 We worked through a couple of the Musical Futures: Just Play resources and at the end discussion started about how this group could make Just Play possible for their schools. What really seemed to resonate with the group was that because JP is scaffolded for generalist teachers it has the potential to be sustainable, for the primary children in feeder schools to then progress through to an established and secure Musical Futures experience that really does build on what they can already do and have learned. Imagine what impact a shared cross-phase approach or pedagogy as opposed to a transfer of information between year 6-7 could have. Credit to Kitt for pulling this group together and generating such interest in only 5 weeks in the job and for engaging his classes impressively quickly in a new approach, so different from what they were doing before. I love the idea of local clusters of schools coming together to design, create, drive and sustain an Musical Futures cross-phase approach that works for them. I’m hoping that I’ll be back in Norfolk soon to work with teachers who are doing it for themselves.